Astrodyne Shielded Room and Communications Tempest EMI Filters » HHP Associates, Inc.
Electronic equipment such as computers and other peripherals can leak sensitive information over conducted and radiated electromagnetic emanations. These signals transmitted down and unprotected telephone or power line can be potentially intercepted by an enemy or competitors miles away. 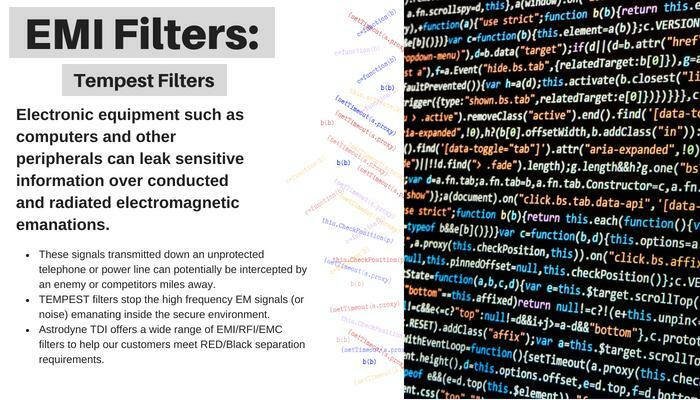 TEMPEST filters stop the high frequency EM signals (or noise) emanating inside the secure environment. Astrodyne TDI offers a wide range of EMI/RFI/EMC filters to help customers meet RED/Black separation requirements. In addition to TEMPEST filters, all of Astrodyne TDI’s shielded room filters and communication filters provide TEMPEST level EMI performance and can be used in those applications. To stay updated with news, pictures and other important information, please follow Astrodyne on Facebook and LinkedIn.